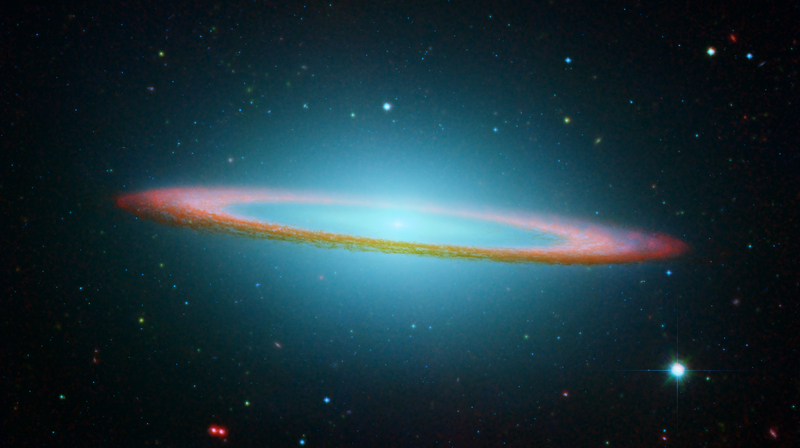 This is a composite image of visible and infrared light observations of Messier 104, commonly known as the Sombrero Galaxy. The visible light images were taken by the Hubble Space Telescope's Advanced Camera for Surveys. The Hubble images were taken in three color filters (red, green, and blue) to produce natural color images. The infrared observations were taken by the Spizter Space Telescope in 4 different infrared filters. Each filter was colored with a visible light color to produce a false-color composite: 3.3 microns (blue), 4.5 microns (green), 5.8 microns (orange), and 8.0 microns (red). The Sombrero Galaxy is a disk galaxy like the Milky Way and is located some 28 million light-years away. We view the disk of the galaxy nearly edge-on.